Nimble wire spoke rear hub, Shimano splines (Campy also available). 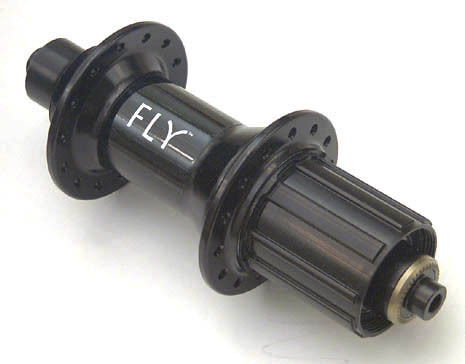 Nimble's newest generation rear FLY and Spider hub weighs 218 grams. It is available in Shimano and Campy configurations (with interchangeable parts kits to convert across brands). It is light, tough, reliable and offers precise clutch engagement. It has an aircraft alloy shell body and cassette body with 100% compatible cassette splines. The 4 bearing system uses precision stainless steel sealed cartridge style bearings for great rolling resistance, low maintenance and durability. The clutch is the same Swiss made steel 18 point star ratchet used in the CROSSWIND rear hub. Clutch parts and spline parts kits are interchangeable between CROSSWIND, FLY and Spider (after 2003). The drive side dropout face is steel for secure hold under high load. See hub rear hub assembly, and pricing.